There is nothing better than walking across the beach at anytime of the day, but at 3.30am on a warm July morning there is nothing quite like it. On one side of the beach, dancing across the shallow waves was the moonlight. On the other side the sun was waking up on the horizon. Kissing the ocean with blushing pink lips, fiery orange flames and bathing the sea in yellow, glorious yellow light. It was like walking in two worlds at the same time. One of darkness and starlight the other a technicolor dream. 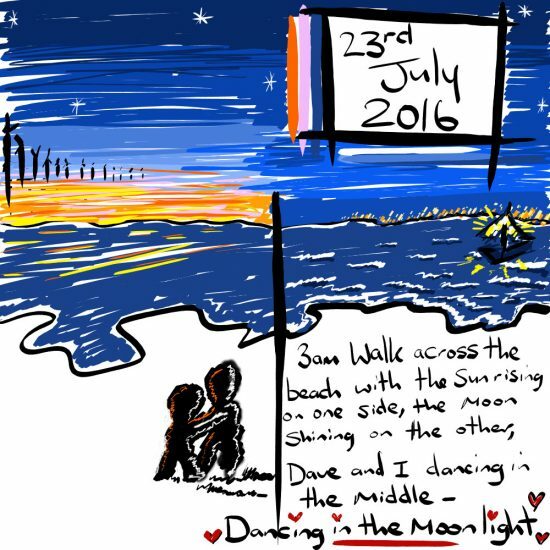 Best bit, when we danced in the moonlight on a deserted beach, no one but us. We had the beach to ourselves. It was quite serene with a fishing boat on the water and a few gulls that had woken up from their slumber.